Been in Padstow, Cornwall for six days - thankfully the six hottest days of the year so far. Gorgeous. London is filthy. Rick Stein is boring. There are a lot of fat people eating icecream at the seaside. More later. 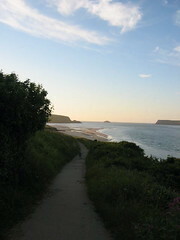 i'd put up with the fat people and a boring rick stein if it mean i could swap osaka for cornwall right now. the humidity here is oppressive. and there are no fat people to look at either. (Un) Mobile phone - hey 80's laydeez! Tin foil. What can it mean?